Thanks to a research grant from the Early American Industries Association, I was able to spend this past week at the Winterthur Museum doing research for my Jonathan Fisher book project. My trip was to the accomplish two goals in particular: 1. 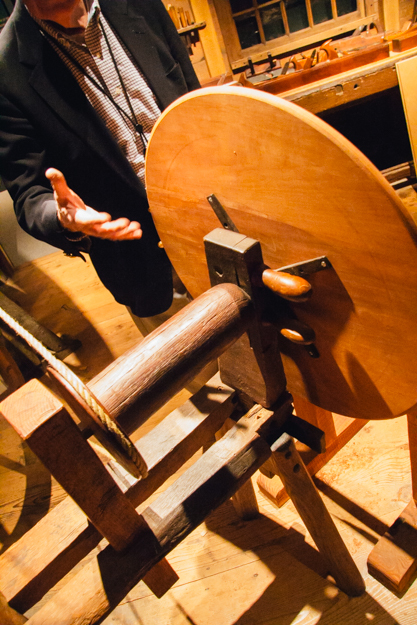 Consult with Charles Hummel about interpreting artifacts from pre-industrial furniture makers and 2. 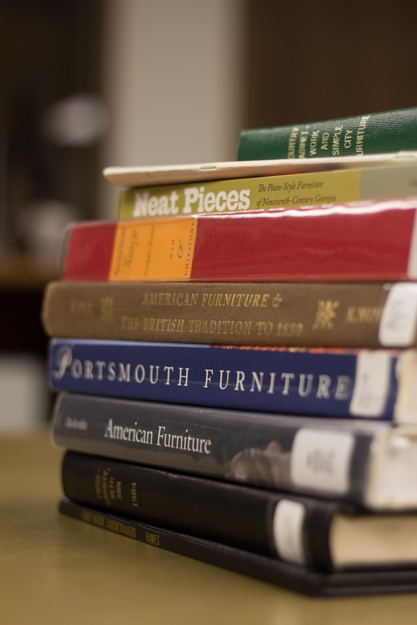 Utilize their library’s resources to deepen my understanding of the larger context in which Fisher made his furniture. My expectations were exceeded. 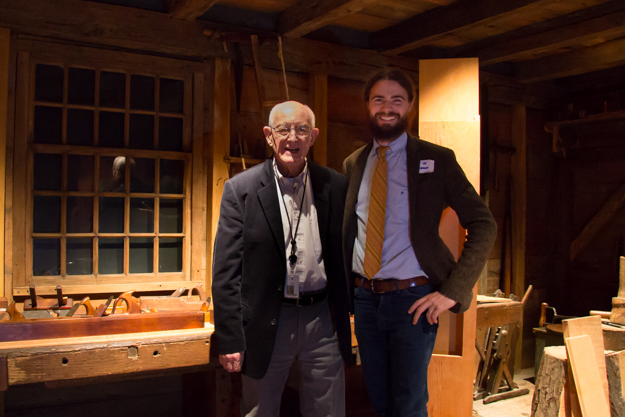 Mr. Hummel’s generosity and wisdom has given me now a much clearer understanding of Fisher as a cabinet and chair maker. 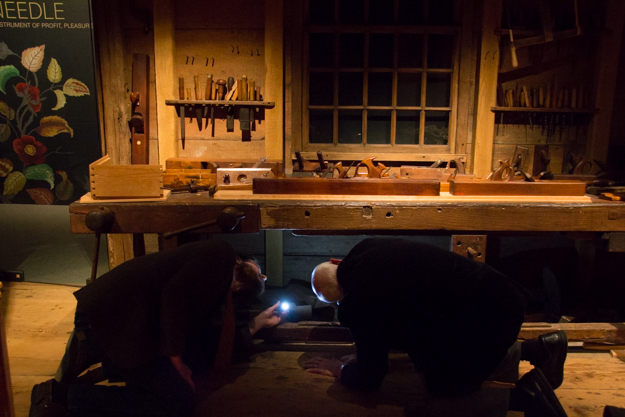 We spent days discussing my project, going through Fisher’s diary along with photographs of the furniture and tools. Charlie’s observations were interesting to hear. Many lightbulbs went on for me and a lot of my own analysis was confirmed by him (which was relieving). Part of my time with Charlie was spent looking at his Dominy research to compare to Fisher’s story as there are a number of parallels between the two. We spent hours in the Dominy shop examining artifacts. When Charlie would hand me a tool for closer examination it was a “pinch me” moment. It was enlightening to see these things up close and personal. He also gave me a private tour through the massive Winterthur furniture collection and we pulled out drawers, opened doors, and stuck our heads under tables. It was an incredible week and one I will never forget. The hospitality and assistance of the library staff was also a tremendous boon during the week. Emily Guthrie, Lauri Perkins, and Jeanne Solensky were especially accommodating by familiarizing me with the library’s resources and retrieving ephemera and rare books for study. Not only do they have just about every book, essay, and thesis ever written even remotely relating to American decorative arts, but they also have a plethora of rare books and ephemera accessible to researchers. It was a pretty amazing experience to be handed a 1701 printing of Charles Plumier not to mention all the other 18th century texts like Moxon, Diderot, Whittock’s Decorative Painter and Glazier’s Guide, and Hogarth’s Analysis of Beauty. My book purchase list has doubled. I am so grateful for the opportunity to spend a week immersed in the richness of the decorative arts preserved at the Winterthur Museum. I am now even more confident that my research into the furniture making of Jonathan Fisher stands on solid ground. Thank you to the Early American Industries Association and the Winterthur Museum for supporting the research and preservation of this aspect of our cultural heritage.